We talked to Andy Budd about the role of design in startups, the difference between designers and stylists, and the danger of chasing MVPs. Andy gave a fascinating interview packed with insight and experience. As always with Inside Intercom interviews, the visuals here were not created or endorsed by Andy. Des: Welcome to Inside Intercom. Today we’re joined by Andy Budd, who is the CEO and co-founder of Clearleft, Brighton and the UK and Europe’s hottest design agency. Thank you so much joining us Andy. Andy: Hey Des, how are you? Des: Great, thanks. I’ll get straight into this. I saw your talk on using design as a competitive advantage. It raised a lot of interesting issues. One was how the role of design in product has changed. Des: Do you feel that product design is more important today for a startup than it was five years ago? Andy: That’s definitely true. In the early days, startups were tackling new domains, without competition, and often solving really tricky problems. People wanted to use their product to solve their problem despite the design. A lot of early startups were exactly like that. They solved a problem, and people wouldn’t really care about the design. Expectations have grown over the past 5 years. The quality of product design has gotten so much better. If you’re launching into a competitive market space it’s very difficult to launch with something that doesn’t have a really good design concept behind it. There are still markets, particularly in the B2B world, where I’m seeing a lot of products launching that still don’t quite have the level of design that you’d expect from consumer products. But even then, in B2B products, there’s a higher expectation. I think a lot of this has grown out of the fact that these days we’re not just using consumer software. We’re also using B2B software more. We’re using it on our iPads and our iPhones and there’s an expectation that the quality needs to be there. Des: That’s interesting. This is what people speak of as the consumerization of enterprise software. Customers previously accepted that business software had to be old, dull, and gray. Now people are asking questions like “If we’re going to have a shared knowledge network at work, why can’t it look like Facebook? Why can’t it look like Twitter?” The result is that some of the older tools are losing out to younger, better-designed contenders. Andy: Absolutely. That’s a really good observation. It’s not just what a product looks like, though. Businesses are realizing that if their workforce are using a piece of software day in and day out, and if it’s difficult or complicated to use, then not only do you demoralize your workforce, but that productivity also goes down. If the tool is clunky and it’s tough to do the fundamental tasks it’s designed for, then it takes twice as long to use. There’s a realization that usability and utility are important, and that was never the case before. It’s an interesting trend, one that we’re seeing continuously grow and mature. 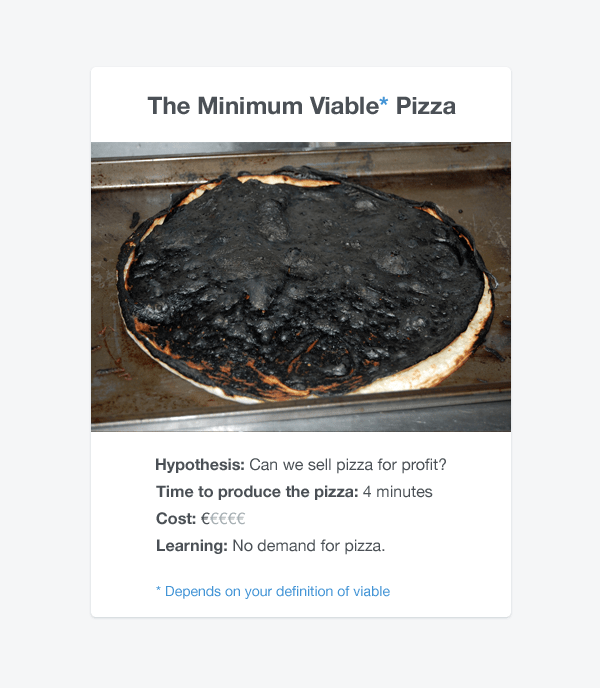 What about Minimum and Viable? Des: Startups are often advised to shoot for a minimum viable product. As design has become one of the most important parts of a product, it becomes tricky to determine what ‘viable’ means. If you rush to market with something that was poorly designed, it could fail and you’d naïvely conclude that the product was a bad idea, whereas in reality, you just rushed through the design phase. Do you have any idea what level of design is appropriate? Andy: It’s a tough problem. The kind of concept of a minimum viable product is popular among the people who fund startups, because they want to lose as little money as possible. If they can gain the biggest level of certainty of success with a minimum amount of investment then they’re happy. The reverse is true for the startup owners. If you want to launch something, you want a really high level of quality to maximize your chances of attracting customers. There’s always a tension between the two. An MVP is fine to prove that the concept works, the technology works, that you can maybe sell a few licenses to people. In order to gain any level of growth or traction you need to be delivering quality or people will just go elsewhere. Unless, of course, the market is underserved. The minimum viable thing can be quite problematic. The other thing is how you define viability. People look at it from a technical or feature-driven standpoint. That’s fine, that’s one lens to look through. The things that make products delightful and desirable often don’t feature in this kind of minimal viable feature set. 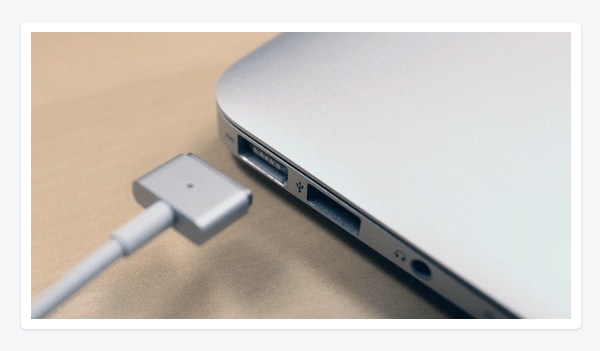 Apple design these really lovely delightful attractions, whether it’s the swipe to unlock the iPhone or the little magnetic power cable on the MacBook Air. You end up fiddling with it, and it has this lovely little click as it eases into place. These are the things that make people fall in love with a product. The thing is you’d never find the magnetic click, on an engineer’s list of MVP features or user stories. It’s really easy in minimal viable products to actually design the delight out of them. 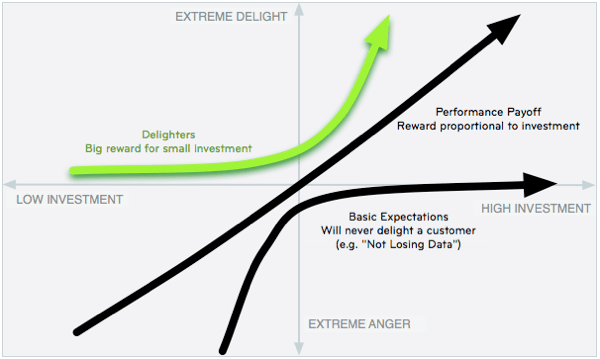 You also need to balance the fundamental features with the delighter, as they’re called in the Kano model. This is why it becomes really important to involve designers at the start of the process; the designers are the ones who are focusing on the whole experience, and not just the feature set. Des: You’re drawing a distinction between a minimum viable product and a minimum desirable product. Andy: Exactly. As I was saying earlier, I think the viability of the minimum viable product is from the perspective of the funders, and it’s figuring out whether this thing is viable as a business, whether people will pay money for it etc. That doesn’t mean that it’s viable for the users and whether it’s a great product that lots of people will jump onto. Be really careful what your understanding of viability is, and who the product is for. When you’ve got a target market that’s captive, you don’t need to worry as much about the experience, but if you’re looking to broaden that market, to cross the chasm and move outside early adopters onto a more savvy and concerned purchaser, then you’ve got to try to convince them to buy the product. Design is often one of the few competitive advantages that people have. So I think it’s important to have design at the heart of the process if you want to cross that chasm and have a hugely successful product. Des: This is the old bought versus sold idea, right? If a product is bought, it means that users are so attracted to it, that they’ll literally chase it down and queue up for it. If it’s sold, it means that there are people on commission trying to force it into customer’s hands. And I find design can often be the key difference between those two types of models for business. Andy: There’s a lot of logic in spending less money on marketing and sales, and more money on creating a brilliantly delightful product. If you do something that people really, really want, they will tell their friends. Recently I talked about how Dropbox were originally spending quite large amounts of money on pay-per-click marketing. They were spending more money to acquire a user than the user was worth. That seemed like a crazy idea to them, so they turned their marketing spending into building a seamless experience. There were dozens and dozens of file transferring services before Dropbox but Dropbox won the market, because they provided a superior experience. That’s what people are looking for at the end of the day. Des: When a company decides it’s time to get serious about design, they go to aesthetic showcases, such as Dribbble, find who is leading the pack there, and put them in charge of design. One of the points you made was that if you do this, you end up with a ‘stylist’. 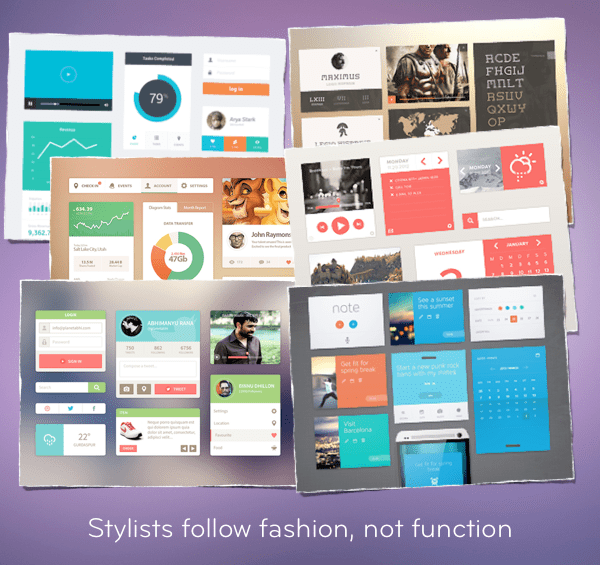 Could you distinguish what you regard as a stylist, as opposed to a designer? Andy: Absolutely. I think a lot of designers work in such a way that they are stylists. On the showcase sites you see designers acting in public for the praise of other designers. A lot of the design you see isn’t solving particular problems, and it isn’t particularly thought-out. A lot of it is mimicking styles. People are following the various design trends and are really great at mirroring them. These people tend to be relatively cheap, efficient, and incredibly attractive to startups. They’re able to produce something that looks very, very slick and very polished very quickly, but the eye of the stylist tends not to focus on deeper problems. Often stylists are only able to do one or two kind of styles that are really different, and find it really difficult to break out of their box. What often happens is they end up being told what to do by the founders rather than interpret and solve these tricky problems. I think the stylists are very important. It’s good to have a few stylists on your team, but actually, I think you’re better off having a stylist come into the project later. At the start of the project, you need someone who’s more of a design thinker, who isn’t into producing glossy visuals, but is able to rigorously tackle problems in a designful way: by using the various techniques and understanding of human behavior and interaction with design to solve the broader and trickiest problems. It’s really important to have more senior people involved at the start—a really good interaction designer, a really good UI designer. Once you’ve solved all those really, really hard problem—the ones that come up right at the start of the project—then it’s easier to bring in less senior people. More stylists can come in and layer the style over the top of the design. If you try and do it the other way around, you get into real problems. I see many startups who, 18 months down the line, don’t have a very nice product. Even when they have a really pretty product, it doesn’t solve some of the fundamental challenges they have, and their users have in the space they’re operating in. If they’d hired a really good designer, that designer could have solved the problems in three or four months, left the project, and then they could have hired the stylist to carry on and maintain and update. But I think a lot of start-ups, in the understandable desire to save money and move quickly, ironically end up costing themselves more money and moving a lot slower, because they don’t have the foresight. Des: I think you could add a little bit there, but I follow from your principle. It reminds me of the Henry Ford quote: “If you need a machine and don’t buy it, then you will ultimately find that you have paid for it and don’t have it.” By not taking the plunge and bringing in an experienced designer up front, you’re paying far more than what it would have cost you, ending up with a product that’s probably not going to be designed at all. Andy: Exactly. I see people that hire a stylist for three or four months, not be happy with their work, to hire another one that’s got slightly higher day rate, not be happy with their work, then hire a senior consultant and not be happy with their work. So, you end up spending a year or two years trying to get your product to a stage that if you’d started out paying somebody with double the day rate that could do it in three or four months, you’d be a year ahead of where you were at the moment. You’d be a year ahead of the competition, and you’d have a really good product. Investing in design is an investment, not a cost to be managed. Good design skills will improve your design, and ultimately that’s all you’ve got in the product. You’ve got the design and you’ve got the technology, and the technology is becoming increasingly commoditized. The power of technology is becoming less and less of a differentiator, and I think design is one of the few competitive advantages that most startups have left now. Des: Does this come down to the culture? Bill Buxton noted that Jony Ive was at Apple for 5 years with minimal output. It was only when Steve Jobs returned that industrial design became a competitive advantage for them. Do you think it is possible for an engineering led startup to grow a design culture later on, or does it take a change in leadership? Andy: It’s very difficult for organizations led by somebody with a particular world view to be particularly good in another sector. For example in the agency world, a lot of agencies try to do both design and development. Because the co-founders are developers, it usually is really difficult to get a design culture on board. Similarly, I see a lot of design agencies that want to do develop software as well. Unless one of the co-founders is a developer, it’s really tough to kind of imbibe that spirit and encourage it and lead a tech team. The same is true in the startup world. 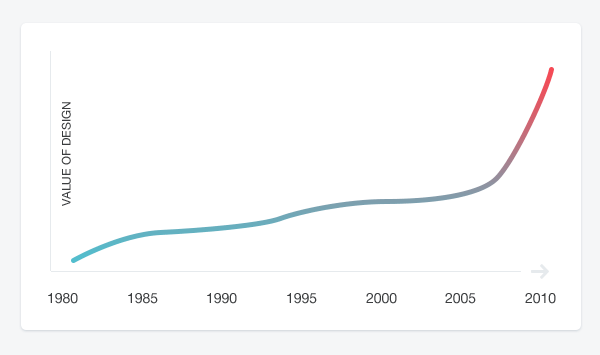 Startups have traditionally been very tech-heavy. Great places for technologists to work, but the designers there tend to be just there to service the developers. To some extent the agile development and lean startup processes entrench that relationship—that the designers are in servitude to the development process, rather than it being more of a partnership. It’s ironic, considering agile process is ultimately about working together with teams, but when you see agile being deployed, often it’s this never-ending freight train of the development team pushing changes and the designers struggling to churn through it all. Des: So what can be done? Andy: I think it’s really difficult for organisations that don’t have founders who are designers to install a design culture within an organization. It’s important to have either a design co-founder, or at the least someone very senior on the design team early on to build the same level of culture in design that most start-ups naturally have with their technical team. If it’s a start-up that doesn’t have a strong design culture then it’s a struggle. This is one of the big problems that traditional organizations have. I speak to so many designers and developers day in, day out, and they’re fighting to get their bosses to really value the work they do. And it can be a struggle. You change things around, but things change really slowly. They change when junior people are given more responsibility and are charged with looking after and growing the design team. That requires real insight from the leaders of the company. It also requires the leaders to value the expertise of the people they’re hiring and get out of their way. One problem with startups is that it’s usually the founder who was the product person, was the designer, he was the person who had the vision for the company, and it can be really difficult for them to step out of the way and let the designers do their job. It’s similar to any profession. If you’re a doctor and you’re having a patient coming to you day in, day out telling you the treatment that they think they should get because they read an article online, you’re going to get very frustrated and you’re going to leave. I think the same is true for designers. I find more designers who are frustrated than are feeling self-actualized because their bosses and managers are telling them what they should do rather than relying on their expertise and their knowledge and their problem-solving ability to do the right job. So, get out of the way of your designers, just as you get out of the way of your developers, and trust them to do a good job. Des: That’s an interesting comment. A lot of people leave agency work because they’re tired of having these clients that they’re subservient to, so they go to work on a product full-time under the belief that they’ll be finally liberated. If they’re joining a culture that isn’t design-led, they might find that they’ve jumped out of the frying pan and into the fire. I think that’s a good place to leave it. Thanks so much for your time Andy, it’s been great. Andy: Thanks Des, it’s been a pleasure. Andy is on Twitter, keeps a personal blog, a company blog, and contributes to The Pastry Box. Clearleft are a fantastic design consultancy, also offering conferences such as UX London, Ampersand, and dConstruct.